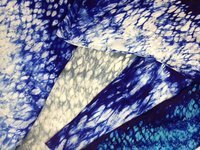 Shibori is the ancient Japanese art of cloth dyeing. It refers to several techniques that are used to dye patterns onto cloth. Among these techniques are tying with string, stitching a pattern, or clamping the folded cloth with wooden blocks. Master artist, Setsuko Hayashi, will join us on May 18th at 1:00 PM in the GVJCI Nisei Veterans Hall to lead another of her popular workshops. Space is limited, so reserve your spot in this popular workshop early! GVJCI . Last modified Apr 28 2014 5:20 p.m.